It was a very cold day compared to last year(HERE) but I still had an awesome time. 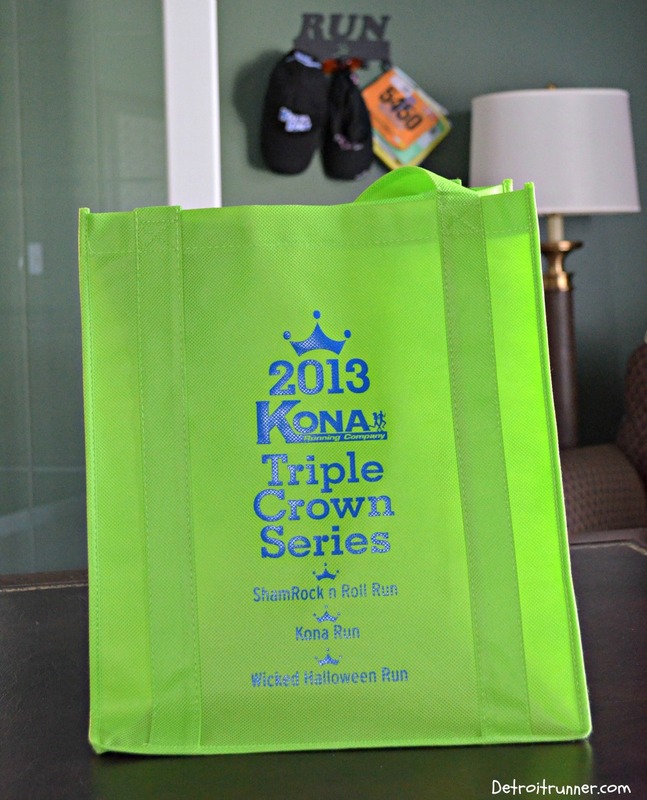 Kona Running Company always does a great job on their races and this was no exception. Overall a well organized run, a great theme and good company. Over 4,200 runners total for the event - a great turnout! I registered by mail since I'm one of Kona's race ambassadors so I mailed in my information and was all set. Online registration is through Hughesware which is an incredible company that helps manage the sign up process. Very simple process. Enter your information and you are in! Every race should use this system. Of course, with Kona Running Company's race, you need to get in early since the 10k sold out this year. Because I was volunteering at the race packet pickup, I got my packet when I went to volunteer the day before the race. I signed up for three hours of giving out packets and it was a good experience as always. I'm happy to give back to the race and will post about that experience later. We(my running buddy Kevin and I) picked up our packet before we started handing them out. It was literally a 3 minute process. We walked in, got our name with our number, then gave the number to a volunteer and received our shirt and bibs along with our race bag. One snafu that I experienced was that I received a bib that did not have the race name on it. I contacted the race director about it(who answered my inquiry almost immediately via email which is impressive the day before a race). He said the last 10 days, there was a tremendous demand for the race so they increased the number of participants not realizing the demand would be so strong. I'm all for allowing more runners into the races for the benefit of those runners plus a portion of the race money goes to charity. The key is that the timing bib worked and I received an accurate time. Perhaps others may have wanted to keep the bib but I didn't see it as a big issue but just one to mention. The expo has several companies there with their products. They also had a mud race there promoting their race. Overall the race was well organized at the expo and had plenty of volunteers to help out. In addition, it was a bonus that the packet pickup was inside given how cold out it was this year. Here's how the packets were set up. 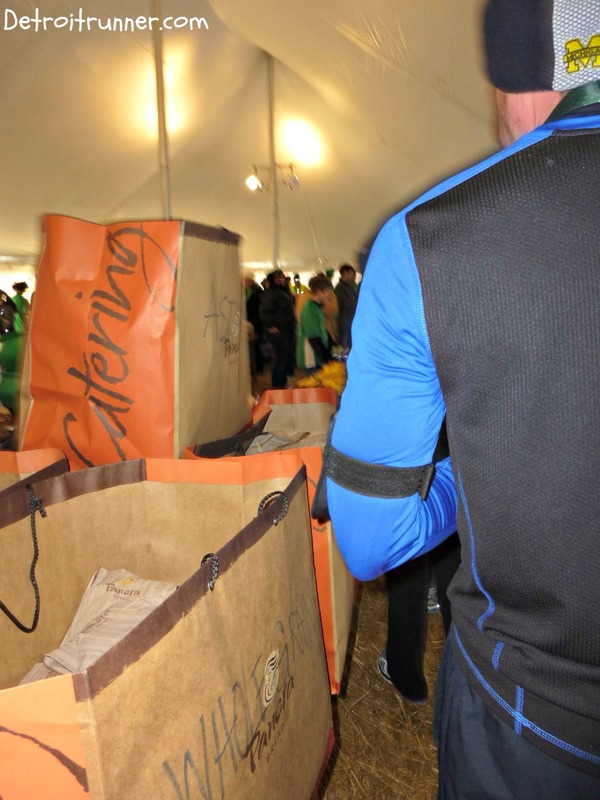 Runners gave their number, from a wall set up by the race staff, to the volunteers and then they pulled out a nice race bag along with the shirt, bib and safety pins. Since I was there for several hours, I could see that things were very well run. It was very busy at times but I took the following photo when it was slower. I've always been very pleased with how things are handled at the pickup for Kona races. The next day we got started early by leaving my home by 6am since I live on the eastside. We ended up getting there at 7:10am. It was a little early but the parking fills up fast in downtown Plymouth so I'd rather be early than late. I talked to one of the other runners who got there at 7:35am and had to park a little further out but overall there is plenty of parking for runners. We got a great parking spot behind the farmers market right near the finish line. When we got there, they already had the area set up. You can see they have steel baracades set up for the finish shoot. Further into the park, you'll see that the race also had trash cans already set up near the race tent. Sometimes it's difficult to find one at a race so I was glad to see them. The park and downtown Plymouth is a perfect location for a race. There is plenty of room to start and finish and also room to have food and entertainment before/after the race. The race had the maps and other information about the race for anyone that still had questions. The communication before the race even started was excellent. There were frequent e-mails to keep you abreast of things as they got closer to the race. I would be surprised if by this point anyone who signed up for the race did not know what was going on. This sign was located right by the tent in downtown. Inside the tent was the costume contest. It was nice to see that they had this in the tent because otherwise the poor volunteers would have been freezing. It was also a great place to help keep the runners warm although the primary purpose of the tent was for the after race food. The race also had plenty of port-o-potties not only near the farmers market but also in the park. They also had public restrooms - bonus! Yes, I take pictures of port-o-potties. Haha! As you can see below, there were volunteers getting the tent set up for the finish line food as well. I was happy to see the race allowed runners in here. Had this tent not been available, we wold have likely gone back to the car until just before the race. There were lots of runners everywhere trying to stay warm and the race actually had a heater blowing in warm air into the tent. A great idea given the temperature was in the 20's and it allowed people to be more social. I helped organize a meetup with several bloggers and local twitter users in the area. While we did not have much time(plus it was cold), it was great to meet everyone that came. It would be great to get another opportunity during the Kona run in June. In the photo below - from left to right - is Katie(@RunsForCookies) from Runs For Cookies blog, Josh(@protomedal1) from Clippin' Along blog, Andrea(@ajbgillespie) from Beat It, Treadmill Creeper, Kevin(and my running buddy) from @kmjones234 on Twitter, Ty(@ty_runs) from This is how Ty runs, Rich from @warrenri on Twitter and finally myself, of course, Detroit Runner! I also saw several groups taking pictures. Blogger/Twitter group pic - awesome people! After we got a picture, we headed back to the tent to stay warm until the start. Even with all the people that ran this year, we still had time to wait until 10 minutes before the race started. This is a big bonus not having to line up 30-45 minutes before the race starts. We then headed over to the race start. Morgan Whitehead was doing the National Anthem as she has done in prior races and she's got a great voice. I love that the race director's daughter does the National Anthem. It's gives it a hometown feeling. 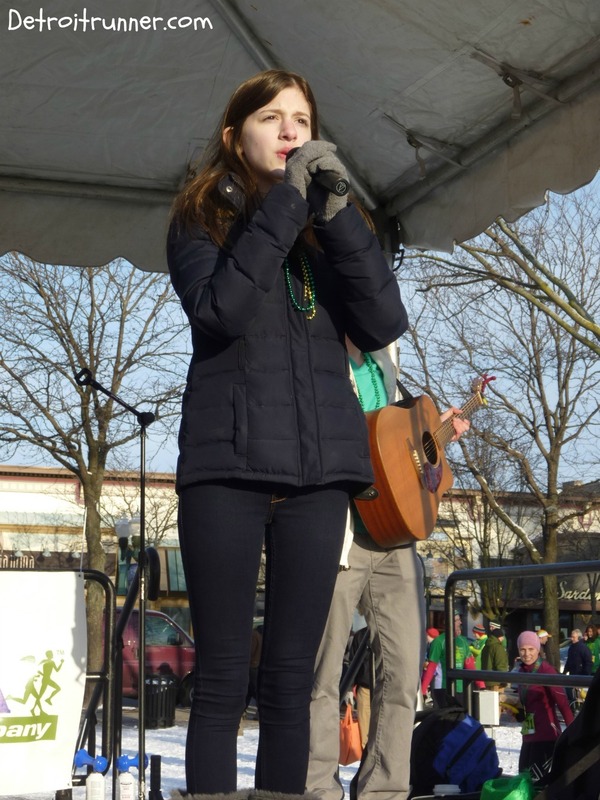 Here she is singing the National Anthem just before the 5k race. The race had two waves for both the 10k and the 5k which was a great idea to help reduce the backups in the beginning of the races. It kept the race much more organized. Because there was an hour between the start of Wave 1 on the 10k and the start of Wave 1 of the 5k, you could in theory, run both races if you signed up for both. As she sang the Anthem, I took a picture of what the start area looked like. Yes, it looks busy and it certainly was but it's also in a well organized fashion. Once again, it's clear that the race staff has plenty of experience in making sure the races goes off without a hitch. I also felt having the packet pickup at the middle school this year probably helped make it even more organized because it really forced runner to go there if they decided to race at the last minute and not get to the race at the last minute. This kept the race on time - a huge plus in my opinion. Start line - ready to race! Runners behind me as well waiting to start - can't even see all the way back. The race director got everyone started with a blow of the air horns. 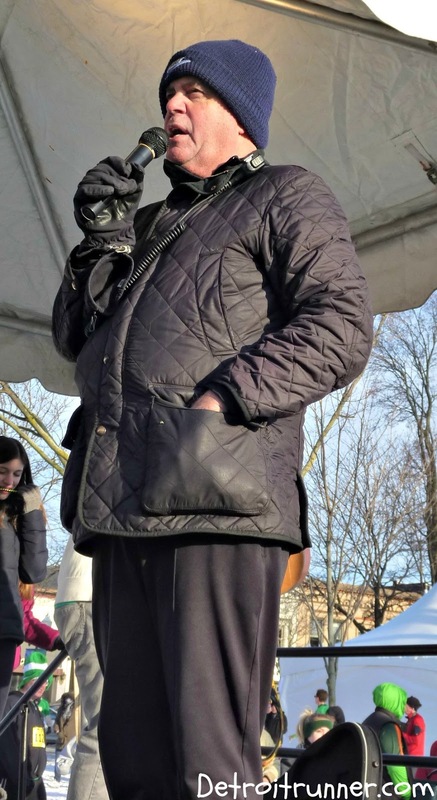 Here's a close up of him talking to the 5k crowd before their race. With the blow of the horn, we were ready to race! The course starts in downtown Plymouth, runs through the neighborhoods of Plymouth and finished back in downtown Plymouth. The course is a flat and fast course and a great race if you are trying for a PR. In fact, my 10k PR is at the Wicked Halloween run last year which is the same course. While the course is not completely closed, the race has very little traffic and the major roads are stopped by the local police. There was plenty of volunteers out on the course along with many police officers keeping everyone running in the correct direction. The volunteers did a fantastic job as always as well as the local police. Here's a look at my splits. Not even close to a PR for this race but it probably didn't help that I ran 10 miles the day before and then stood on my feet at the expo for four hours. Fortunately, this race was about fun for me - plus I had to get that medal! Haha! One of the things I really love about Kona Running Company's races is that you have the ability to run this as a race, run it as a training run or even walk it. They are very accommodating for all types of runners/walkers so these races are not only best for experienced runners but also new ones and/or walkers. They allow ample time for anyone wanting to get out there to finish. Note: I take pictures all through the race and don't slow down so some are good and some are a bit blurry. Please keep that in mind when viewing the photos during the race. As the horn blew, we were off! I tried to keep a fairly steady pace in the beginning and had to do a little weaving around runners, but overall everyone was running at a very good pace and was in the correct pacing. I think having the pacers mixed in there helped keep people where they should be. After less than 1/4 mile, I already caught up with the 52 minute pacer. For those of you that did not know it, Kona has the only 10k races with pacers in the country. Cool! Since I was not really following the pacers(although I originally planned to); I wanted to go a bit faster pace, I passed them by. Subsequent to the race, I talked to one of the paces and he said they came in within 10 seconds of their estimated time. Very good as I think it's difficult to pace a 10k race. As we moved through the neighborhood, I came up on Meghan from Watchmegorun. I said a quick hello to her and continued to run. As you can see, she was one of many that was dressed up in the St. Patrick's day attire for the race. I'm not that kind of guy but it looks fun for those that do want to participate in the costumes and run. I like that Kona encourages it! I found Meghan. She always stands out. Before I knew it, I was already at Mile 1. Notice the snow still left on the grass. It was freezing out! Haha! Now here's a brave soul out here running in shorts in the 20's. His legs look a bit cold, don't you think? Yikes! This is also the first aid station we came upon where volunteers were doing a great job! As I continued along, I was able to catch up to the 50 minute pacer. Then we hit the mile two marker. Things were going by fast. There were a lot of fast runners at this years race considering I only placed 167th but then I ran it slower than racing speed. As we continued on the course, there was a small open area in the neighborhood where you could see runners coming back the other way. It looks like a really fantastic place to live. And there we were, already at mile three! I was still feeling pretty good and I was occupying myself by looking at the great neighborhood. I always feel at home while running in Plymouth. I must have zoned out because now I was at mile 4 already. Before I knew it, I was at mile five. Into mile five, there was a nice little park, Lions Park, that we ran past that had a jungle gym for the kids. A very nice area for a run. After this we got to mile six and you could feel the home stretch coming soon. We turned the next corner and there were all kinds of people waiting for their runners. What a great site to see as you turned the corner. One more turn and we were at the the finish line! While it was cold, it was a nice sunny day. We were fortunate not to have further snow like we did the day before otherwise that would have been a brutel run. Instead, it was a great day to race! There were several aid stations that had water in addition to Powerade. I think it's great the race provides Powerade but given its a 10k, it's not something I would use for that distance so I can't comment on it. It's amazing the race even had the offering of it in my opinion. I'm happy to see that the volunteers were out in full force today and appreciate it considering how cold it was. Not only that, the race had a fluid station every 1.5 miles in the 10k - plenty of water to go around. The finish was also well planned. You came around the corner and the large finish sign was there! It was a wide area and also made for a great place to take pictures of your runner. There was also some good photo spots just before the finish turn. The volunteers below were asking runners to keep moving so the race line did not get backed up. Great idea to have these guys here keeping things flowing. After you came through the finish, there were volunteers there giving out medals for finishers. 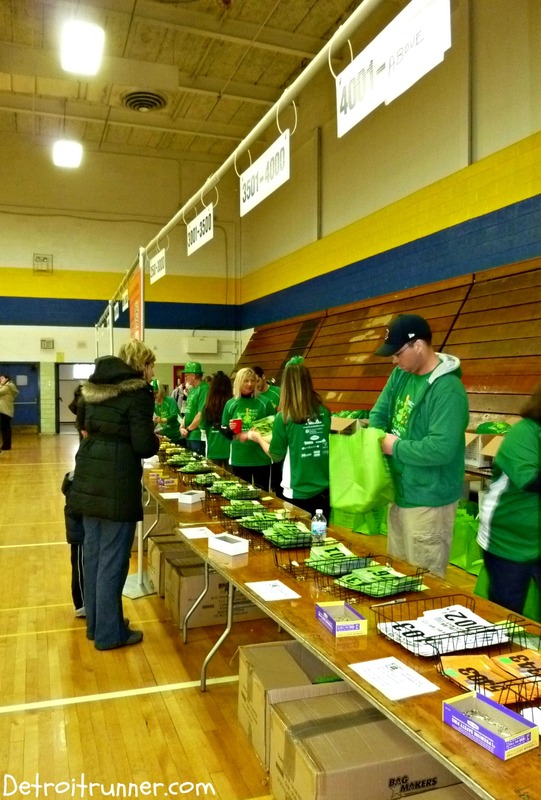 Here's a couple pictures of them giving medals out in their volunteer shirts and St. Patrick's Day attire. The woman that gave me my medal put it around my neck. I love when volunteers do that. It's makes you feel special. After I collected my medal, I went to the finish line food tent that was next to the finish line. As I said, the race had things planned out perfectly. As you can see, they had Panera Bread bagels. I love the Kona races because they always put the bagels in separate little bags with the bagel of your choice. I know this costs more money but it's the little things that make a good race, great! Asiago cheese is my favorite! 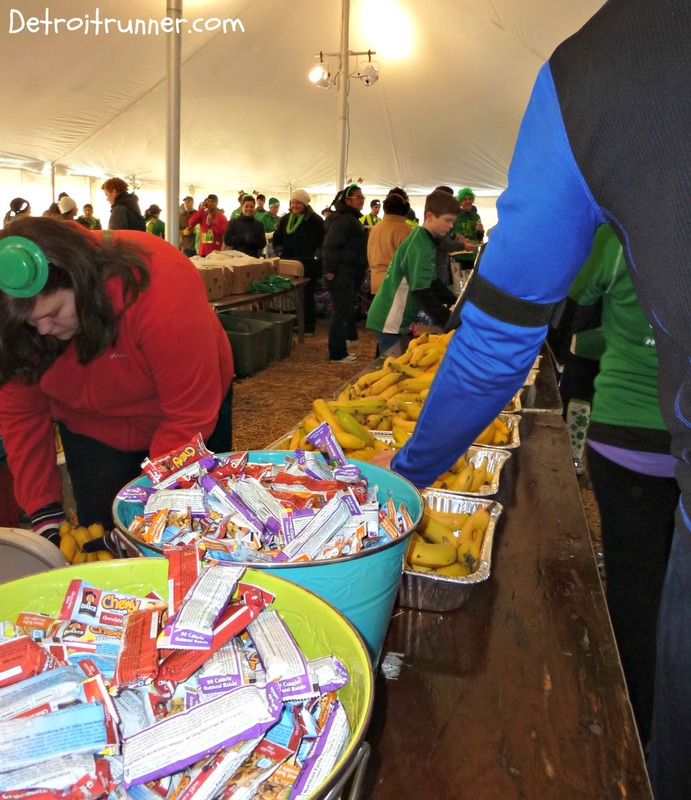 The race also had granola bars and bananas as well as water for the runners. While I was waiting for my running buddy, I took some time to eat and stay warm in the heated tent. The race has a great band playing some St. Patrick's Day tunes just outside the tent. Everyone was having a great time! 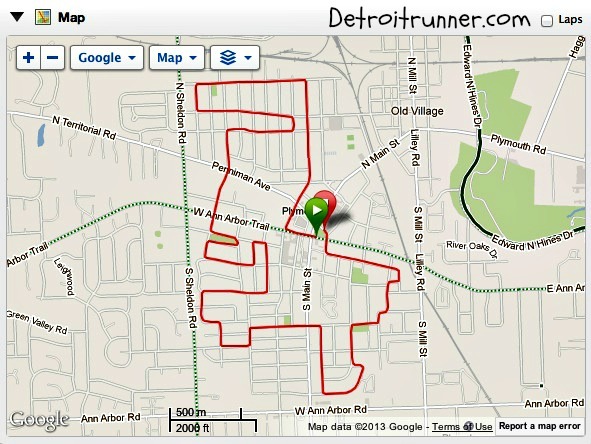 With your race entry, you received a certified course that was well marked and partially closed. You received access to the race expo, a bag with the race names on it for the Triple Crown, a bib with a QR code(although mine rubbed off because I put my bib on my leg instead of chest - great feature though and new this year), a tech shirt, a race bag, and one of the best medals I've ever received for a 10k. As I've said with other Kona Running races, they do an excellent job in all aspects of the race. From the time you register for the race, the expo organization, the start, middle and finish. All aspects of the race were well organized. The fact that a race director would e-mail me back right away the day before a race(when he has 1000 things going on) is impressive. Given the experience from the race staff, I would not expect anything else. Overall, Kona Running Company put together yet another great race - one of their best in my opinion. The expo was new this year. The medals were better than ever. The course is always a great course to race. The wave start keeps things not only organized but helps keep runners frustration of running around people down. The entertainment is entertaining. The runners costumes are funny and creative. The volunteers are incredible. It's a race I would surely enjoy doing again and I look forward to the other races(Kona Run and Wicked Halloween) in the Triple Crown series. So if you have not run a Kona Running Company race, sign up for one and get in on the excitement. If you did this race, sign up for the Kona Run in June so you can be there for part two of the of the Triple Crown series. Note: I am an ambassador for the Kona Running Company which includes a complementary race entry in exchange for a review. All opinions on the race are my own and I was not required to give a particular review. Wow how awesome!!! it just looked so cold!!! Congrats on a great race! Love the shirt, medal, and blogger meet up! Sounds like an overall great time!! Great recap! Bummed I missed out on this one. Hoping to do Kona and Wicked. You should have started at the back so you could have taken pictures of every pacer as you caught up!! Just kidding! I paced 65 minutes and it was so odd to finish a race and not feel like collapsing into a heap on the ground!! Our finish time was 1:05:04! We were only 4 seconds off! Our runners all took off sprinting in after the 6 mile marker so they finished under 1:05! It was hard to not take off sprinting! As for that wave thing - what exactly was the purpose? Do you really think 10 minutes was necessary?? In that 10 minutes, my feet became totally frozen. I know you aren't on the staff of the race; I'm just asking your opinion. I do know a staff member (how I became a pacer) so I will eventually ask him. I wondered if the course was as flat as it seemed. 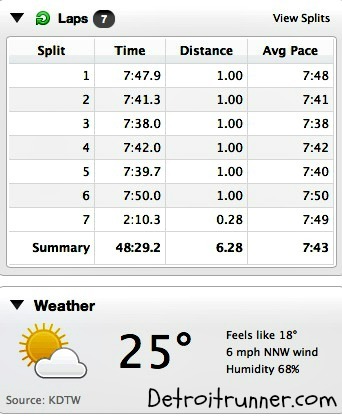 Since I was running 1:30/mile slower than if I was racing, I might not be a good judge of that. Now, I wonder how I'd do if I was really running it! The 10 minutes makes a difference so the slower runners are in the second wave and you don't have to run around them as much. By the way, I know Larry too. I thought everyone does. Haha! Also, it's a flat course and great for PR. Yes, Larry O'Sullivan knows everyone and can talk anyone into anything!! I'm a night worker (by choice) and I do NOT do mornings but somehow he talked me into being in Plymouth at 7am which meant that I left my house at 5:45 am, even though I repeatedly told him no! But...I'm glad I did; I had a lot of fun! He's already asking about the next race! We came up on a group of walkers around mile 1. I looked and they all had 10K race bibs on so they had to have started in the first wave. It was really funny watching them try to end the first wave! People were just pushing by! We (65 minute pace group) ended up right up by the start line by the time they got people to stop! I've heard a ton of great things about this race this year, so I'm bummed I didn't do it. Those medals look fabulous, and a well organized race is such a selling point for me! Sounds like a great race. Fun medal! I've never seen pacers for a 10K - nice touch! Great job, Jeff! That's a really cool medal, too. Nice to see you enjoying the 10km race, one has to do that from time to time, it is hard only going to races and then running hard, I believe you have to be comfortable at a race and know what it is all about that when you are lining up to race the clock the race thing isn't scary!!! it's also good for a tempo run, would you have run a 48:30 10km on your own? We have a couple of paces in th odd 10km race here in Cape Town. Loved the organization of this event, I rarely come across a race so well organized. Wasn't loving the COLD but it helped me maintain a pace I could hold throughout the entire race and was able to run the whole thing without stopping for the first time since my legs stayed frozen for the first 3 miles. Lot's of little inclines and declines. Huge beautiful medal! Awesome race and the Kona ones are definatly a family favorite! I ran the 10K with my husband and two kids under 10 and it was great - well besides the weather! We got to the school just before 7 and had no wait to get our bibs then headed out to the park. Gorgeous course and of course the medals! Funny thing was the first medal I got had a green ribbon instead of the fancy Shamrock one my famlies medals had. I went back to the finish chute and it was easily exchanged for a good one, lol. We can not wait for the rest of the Triple Crown Series!